Chain of Command is a fairly new Second World War game for platoon plus sized games. 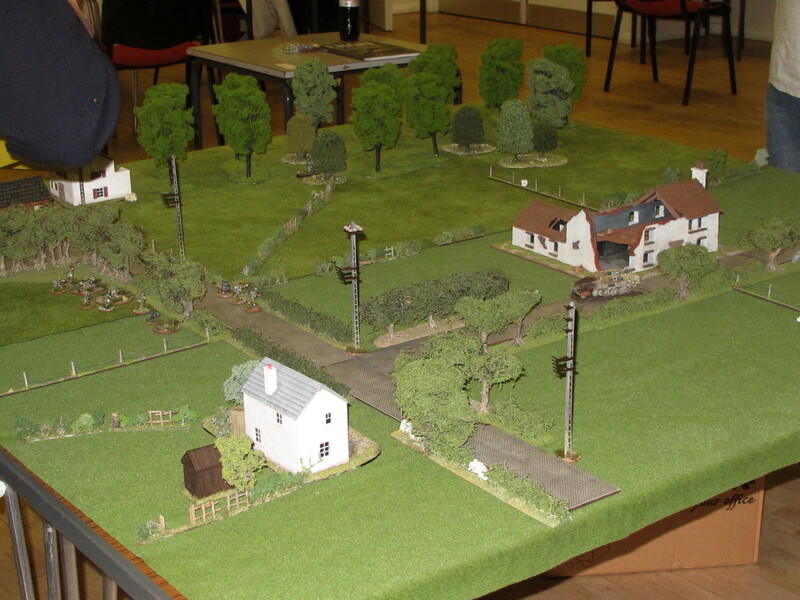 Most people seem to be playing it with 15mm and 28mm miniatures. There’s plenty of choice in the larger scale at the moment, due in no small part to competing rule sets like Warlord Games’ Bolt Action. Ground scale is about 1″ to 4m, which means on a 6×4 table even small arms can hit anything they have line of sight to. Chain of Command is mostly interested in forcing the player to think like an infantry platoon commander. The emphasis is on keeping your sections and support weapons active and adapting to threats which pop up unexpectedly. You’ll need to use your platoon command group and section leaders effectively, and victory is in most cases caused by reducing the enemy’s ability to command effectively through loss of leaders and force morale collapse, rather than through annihilation. Every nation puts an infantry platoon on the board, any differences in force quality and from scenarios simply allow you to choose add-ons from support lists. These are pretty broad-ranging including indirect fire (both on and off-table), support weapons like SFMGs and anti-tank guns, transport, tanks, extra squads, and field defences, as well as engineers for breaching the latter. Higher quality troops such as British Paras or Fallschirmjager get less support while the sketchy Russian hordes will be bringing copious backup. You’ll see a lot more T-34s in CoC games than you will Tigers. Scenarios do allow for an attacker to have more support than a defender, but this is often overriden by troop quality factors. As an attacker you might be forced to take on a numerically superior defender. As a force balancing mechanic, this is one of the best I’ve come across. It results in fairly equal forces, but without the minmaxing and fiddliness of points systems. The forces that go on the table are realistic, but the player has enough freedom to select supports that back up their plan. Essentially you’ve got the same choices as a real commander; you always have the platoon under your command, and you can request extra bits to bolt on. Two things you won’t see on table are artillery and air support. The only indirect fire is from mortars. An artillery barrage is available as a support choice, but it occurs pre-game and disrupts your enemy’s deployment rather than inflicting casualties. A German NCO pointing out which way the war is. The basic command mechanic in CoC is a set of command dice that you roll at the turn start. Depending on what actual results you get these can then be spent to activate elements or units. You might not be able to activate everything you want every turn, and the differing amounts and quality of leadership are a key differentiator of the various combatants. Leader models are crucial. Divided into junior leaders (JNCOs) and senior leaders (SNCOs or officers) they allow you to do more with a single dice and have special abilities such as rallying troops. A unit with one or more leaders attached will manoeuvre and fire more effectively and more often. Leaders however are at high risk of being killed or wounded when their unit takes casualties, and can be easily picked off if going solo. Movement is all randomised, which I actually don’t mind at skirmish level. The effect of individual random events (ie: “What was that noise?”) will affect small units more than larger ones represented in company and battalion sized rule set. Movement is 1d6, 2d6 or 3d6 inches. Coupled with long weapon ranges (you can hit anything you can see) this means that you must use realistic fire and manoeuvre tactics to stay mobile. This is where most of the learning curve in the game is, but once you get the hang of it you’ll find you’re playing a much more interesting, realistic and challenging wargame. What you’ll probably find is that if you want to get good at CoC you’ll go off and brush up on your infantry minor tactics, as the tactics used in real life work well. The author wrote a good series on CoC tactics on the official blog. All troops start in reserve. Units are deployed using the player’s command dice, and can fire at full effect when they deploy. This is often used by defenders to simulate the fog of war, with their defending troops materialising and hammering advancing enemy. Fog of war affects both sides though, defenders will often be unsure just where the main thrust of an attack will come from. Probing, scouting and infiltration tactics work well in the attack. Often defenders will want to stay hidden as long as possible to avoid the attacker’s support weapons, while the attacker will be trying to get them to commit to putting troops on the table. Small scout teams and recce vehicles can be really useful. A novel and interesting feature is the pre-game “patrol phase”, where the two sides manoeuvre several patrol markers to try and grab strategic areas of the board. There’s a lot of scope for subtlety and cunning here. Once the patrol markers are locked into position by proximity to an enemy patrol marker they are converted into jump-off points, from where troops can be deployed during the game. I like this a lot, pre-battle patrolling is a crucial part of soldiering at this level, and rarely represented in wargames. Effectively what you’re doing with the patrol phase is deciding where on the table your deployment zone is going to be. Usually this is further towards the centre of the table than in most other games, meaning there’s no tedious trudge from the table edge that you get in the early parts of gaming with most rule sets. Fire is done “buckets o’ dice” style, with better trained troops being harder to hit, and a saving throw for what cover they’re in. This mechanic makes sense to me, and inflicts both casualties and suppression simultaneously. What the game doesn’t do is model the psychological effect of casualties, a kill is simply removed and inflicts none of the shock points used to represent suppression. This is slightly abstract, but losing men does reduce your ability to tolerate shock and you’ll normally be receiving both. I find it’s best to envisage shock as a temporary loss of effectiveness (psychological), while “kills” are a permanent loss, such as men wounded, equipment destroyed or men out of action while attending wounded comrades. A British section under fire, the yellow dice are showing “shock” accumulating. Too much of this and they’ll get pinned or run away. Medics are available on the support lists, but since only wounds on leaders are represented they won’t ever be patching up holes in your lower ranks. Tough luck, Private Jenkins! What I do like about CoC is that the authors seem to genuinely understand warfare at this level. They’re far more interested in presenting the player with the same choices as a platoon commander than modelling rate of fire differences between a No.4 rifle and a K98. Close quarters combat is included, and is pretty brutal. Automatic weapons and heavily suppressing enemy units before charging are the best way to triumph here. A lot of uncertainty is modelled quite simply, from randomised movement to the use of command dice to activate force elements. The deployment and patrol phase rules cover fog of war, and the combat effects include the shock points that represent suppression. Build up too much shock and the unit becomes pinned, and if it gets really bad they rout. It’s a nice simple mechanic. The basic unit is the section, and they are much more durable under adverse conditions than individual fire teams are. Important events like loss of support weapons, routing sections and leader casualties result in losses to the overall force morale level, which affects the ability to control your force if it sinks too low. Generally it’ll be the loss of force morale that forces one side to concede, although some scenarios have victory conditions such as requiring you to simply reach the enemy baseline. I’ve got plenty of Chain of Command battle reports on this blog, have a flick through to get a taste of how the game plays. Very. Tactically your options are wide open. What works in real life will probably work in the game. Terrain has a huge impact so there’s a strong incentive to lay out an attractive and realistic looking table. The game has tension and friction, but moves along at a decent pace without excessive fumbling in tables and totting up modifiers. The system is very flexible, but does require you to stay sharp. Mistakes are often costly, which keeps play interesting and dramatic. It’s also really flexible. Designing you own scenarios or obscure forces is easy, and the game scales up to multiplayer easily through the free BigCoC supplement. Highly recommended, get yourself a copy today.